In 2001, Toni Bernhard got sick and, to her and her partner’s bewilderment, stayed that way. As they faced the confusion, frustration, and despair of a life with sudden limitations—a life that was vastly different from the one they’d thought they’d have together—Toni had to learn how to be sick. In spite of her many physical and energetic restrictions (and sometimes, because of them), Toni learned how to live a life of equanimity, compassion, and joy. This book reminds us that our own inner freedom is limitless, regardless of our external circumstances. Updated with new insights and practices hard-won from Toni’s own ongoing life experience, this is a must-read for anyone who is—or who might one day be—sick or in pain. Toni Bernhard fell ill on a trip to Paris in 2001 with what doctors initially diagnosed as an acute viral infection. She has not recovered. In 1982, she’d received a J.D. from the School of Law at the University of California, Davis, and immediately joined the faculty where she stayed until chronic illness forced her to retire. During her twenty-two years on the faculty, she served for six years as dean of students. In 1992, she began to study and practice Buddhism. Before becoming ill, she attended many meditation retreats and led a meditation group in Davis with her husband. She lives in Davis with her husband, Tony, and their hound dog, Rusty. Toni can be found online at www.tonibernhard.com. "Beautiful, heartfelt, and immensely courageous. Truly worth reading." "Full of hopefulness and promise…this book is a perfect blend of inspiration and encouragement. 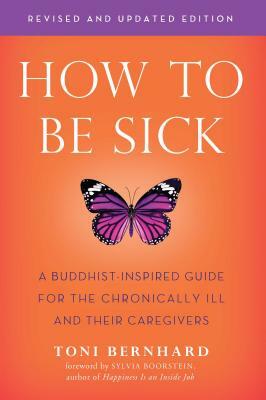 Toni's engaging teaching style shares traditional Buddhist wisdom in a format that is accessible to all readers." “Everyone should read this book—anyone who is sick, anyone who loves someone who is sick, and anyone who has ever experienced things being other than they’d hoped they would be. Toni Bernhard open- heartedly shares the deep pain and equally deep joy of her experience in a way that allows us to validate the pain of our own circumstances, and still find joy and contentment within any context. — Joy Selak, author of You Don’t LOOK Sick!